As “students of the market,” Quincy Capital Partners is inspired by those who have come to exemplify the entrepreneurial spirit in asset management, those who combine a remarkable degree of intellectual curiosity with scientific rigor. Quincy Capital Partners connects asset managers to independent wholesalers in a way that brings a wide new spectrum of investment solutions to the market. 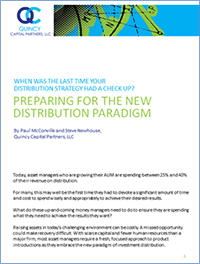 Optimize how asset managers and advisors complement their efforts through the proven techniques described in The New Distribution Paradigm (downloadable here). The new, emerging independent wholesaler – or Independent Distribution Consultant (IDC) – is empowered to be product agnostic, solution-driven, and consultative at the point of sale.